8 March 1910: Entered the Army as a Fahnenjunker in 2. Badisches Feld-Artillerie-Regiment Nr.30. 1 October 1910-30 June 1911: Detached to the Metz War School. 26 September 1914: Adjutant of the II. Battalion of Field Artillery Regiment 30. 17 June 1916: Regimental Adjutant of Field Artillery Regiment 30. 28 August 1916: Adjutant of the Commander of Artillery of the 29th Infantry Division. 5 February 1917: Detached to the staff of the 29th Infantry Division. 24 February 1917: Second Ordnance Officer on the staff of the 29th Infantry Division. 6 April 1917: First Ordnance Officer on the staff of the 29th Infantry Division. 13 December 1917-31 January 1918: Detached to Infantry Regiment 113. 3 April 1918: Transferred to a General Staff position in the V Army Corps. 29 July 1918: Transferred to a General Staff position in the 42nd Infantry Division. 15 February 1919: Returned to Field Artillery Regiment 30. 9 March 1919: Detached for service in the Great General Staff. 14 June 1919: Allocated to the General Command of the VI Reserve Corps for special employment. 21 June 1919: Detached to the High Staff of the Baltic Landeswehr. 24 July 1919: Detached to the Processing Staff of the Baltic Landeswehr (Freikorps). 13 October 1919: Transferred to a General Staff position in Wehrkreis [Military District] Command I. 1 November 1920: While retaining his previous position in Wehrkreis Command I, detached to the Reich Defense Ministry. 1 May 1921-31 May 1921: Detached to the 5th Motorized Battalion. 1 June 1921-30 September 1921: Detached to the III. Battalion of Infantry Regiment 15. 1 October 1921: Transferred to Artillery Regiment 1 and detached to Group Command 1. 1 July 1922: Transferred to Group Command 1. 1 April 1923: Consultant in the Training Department (T4) of the Reich Defense Ministry. 20 August 1923-4 September 1923: Detached to Troop Service at the Grafenwöhr Troop Training Area. 19 July 1924-31 July 1924: Detached to Artillery Regiment 4. 7 June 1925-22 June 1925: Detached to Infantry Regiment 15. 1 October 1925: Allocated to the Troop Office/Group Abwehr [Intelligence]. 16 October 1925: Detached to the 1st Cavalry Division. 1 November 1925: Transferred to the staff of the 1st Cavalry Division and detached to the staff of the 2nd Division as Leader of the Intelligence Section in Wehrkreis II. 14 April 1926-28 April 1926: Detached to the I. Battalion of Artillery Regiment 2. 5 May 1927-14 May 1927: Detached to the I. Battalion of Artillery Regiment 2. 1 April 1928: Transferred to Artillery Regiment 2. 1 July 1928: Chief of the 2nd Battery of Artillery Regiment 2. 22 October 1928-1 December 1928: Detached to the Firing Course for Artillery Officers in Munster. 15 September 1931: Detached to the staff of the 5th Division. 1 April 1934: Commander of the Artillery Demonstration and Testing Command Ulm/Donau. 15 October 1935: Commander of Artillery Regiment 5. 6 October 1936: Commander of Artillery Regiment 35. 12 October 1937: Artillery Commander (Arko) 35. 1 March 1938: Commander of the Jüterbog Artillery School. 5 October 1940: Commander of the 121st Infantry Division in Germany. 6 May 1941: Führer Reserve in the Army High Command and, at the same time, detached to the staff of the 3rd Infantry Division. 22 April 1942: Führer Reserve in the Army High Command. 1 May 1942: Commander of Division Nr. 233 (Motorized). 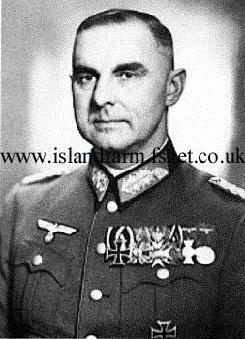 7 July 1942-1 March 1943: Commander of the 233rd Panzer Grenadier Division in Germany. 19 February 1943: Detached to the Reichskriegsgericht [Supreme Court of Justice of the Armed Forces]. 15 March 1943: Commander of the 709th Infantry Division in France. 1 July 1943-1 March 1944: Higher Artillery Commander (Harko) 308 of the 2d Army on the Eastern Front. 10 March 1944: Führer Reserve in the Army High Command and, at the same time, detached to Army Group Center on the Eastern Front. 14 April 1944-24 May 1944: Delegated with the leadership of the 18th Panzer Grenadier Division on the Eastern Front. 25 May 1944-4 June 1944: Delegated with the leadership of the 12th Infantry Division on the Eastern Front. 12 June 1944-8 July 1944: Detached to the Course for Commanding Generals in Hirschberg. 8 July 1944-31 July 1944: Delegated with the leadership of Army Detachment “von Zangen” (LXXXVII Army Corps) in Italy. 1 October 1944-1 May 1945: Commanding General of the German-Italian Lombardy Corps in Italy. 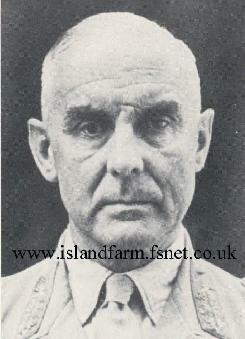 1 May 1945-5 October 1947: Prisoner of war in British captivity. 6 October 1947-25 May 1948: Interned in British custody. German Cross in Gold: 18 June 1942, Generalleutnant, Commander of the 3rd Infantry Division (Motorized) in Russia. Click here to see a photo of General der Artillerie Kurt Jahn in the company of fellow prisoners of war at Island Farm.